The Etrian Odyssey series has kept the sometimes-forgotten pure dungeon crawl alive and well on the 3DS, and has begun to mix things up by bringing its classic core into interesting franchise mashups such as Persona Q. This time around, the flavors get mixed up with the Mystery Dungeon series for a new tactical take on Etrian Odyssey, now with with roguelike elements and unpredictability from floor to floor of sprawling dungeons. 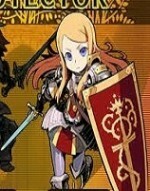 Your party is comprised of classic Etrian Odyssey classes (and the new Wanderer class that’s a clear homage to Shiren The Wanderer) that level up and acquire skills of your choosing via a talent tree system that will be familiar to EO players, and you fill up your guild slots back in town with additional characters and classes. You take your team of four into randomized dungeons, picking up assorted loot drops, consumables, and running over squares for food resources and mana. Your party needs to make sure it has sustenance at all times or will begin taking damage for every square traveled, but once you get the hang of it, this aspect is almost completely forgettable and will never come into play unless you’re trying to exploit situations. The biggest divergence in gameplay from the core series is the turn-based tactical combat. Each turn, you’re only able to choose moves for your selected character, and you swap between characters a lot – potentially every single turn in a tough fight. The rest of your crew performs automated moves based on what you have selected and trained for them. The system isn’t too complex, and you create plenty of skill shortcuts to make streamline the process, but switching between characters constantly on rough floors gets repetitive. Thankfully this system changes on boss fights where you have full party control, turn-to-turn. The automated aspects of combat make getting through trivial floors a breeze, but I often stared at the screen in resigned frustration as the automated characters made poor choices. As you proceed through deeper and more elaborate dungeons, heading down from the first floor to the final boss becomes an almost impossible prospect. To handle this, you need forts – structures you create to “lock” a floor from its regularly randomized layout and provide other benefits, like being able to start your dungeon run at a fort floor. Correct fort placement is essential for handling another new element: the DOE. This take on the roaming ultra-monster wanders up the floors of the dungeon and attempts to get to floor one and the town (causing an adventure loss). If a fort’s in the way, the DOE crushes the fort and retreats back to the depths. Alternatively, you can staff your forts with hardened adventurers from your guild and then join your crew there for a massive assault on the DOE; if you win, you may find some great loot or a quest completion. I love seeing Etrian Odyssey “blends’ like Mystery Dungeon and Persona Q, but the automated party aspects and continual swapping of characters are minor detractors in what is otherwise an incredibly solid dungeon crawl. If you’re a fan of long dungeon dives where treasure or terror lurk around every turn, with floor after floor full of enemies and the occasional DOE leading to the big bosses, this is yet another 3DS RPG you won’t want to miss. A new tactical take on Etrian Odyssey, now with with roguelike elements and unpredictability from floor to floor. Entertainment While not as strong as a core Odyssey title, this blending of games succeeds in being challenging, lighthearted, and entertaining.